A first-time Olympian, physical and aggressive U.S. judo player Marti Malloy is psyched and ready for the London Games. INFOtainment News had the good fortune to talk with Marti 80 days out from the opening ceremonies. When asked what she loves about her sport, U.S. Olympian Marti Malloy answers, “judo is a strategic match where you react to reactions and when it all comes together, it’s beautiful.” She expands that “any one person, on any one day” can have just such a beautiful experience and win in the sport whose name means The Gentle Way. But you get the sense in speaking with Malloy and watching her compete, that this lofty perspective is only one side of the coin. Because you are immediately drawn in by her energy and can very much feel her passion for judo and for competing – and you know that she absolutely brings it in her fights. Always ready to go out and fight, her approach has been that the more you compete the stronger you’ll get – win or lose. “Losing is the best fuel to get better,” says Malloy, although she’s done a lot of winning through the years. 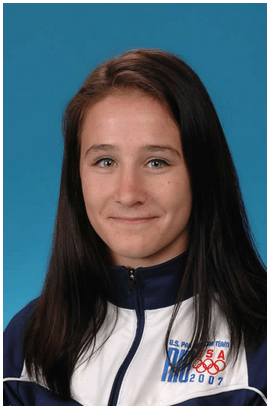 Long known for her physical and aggressive approach – “I will never give up” she informs – Malloy has improved her technical abilities working with her coaches at San Jose State University, a U.S. judo hub. San Jose State has 45 of the 51 NCAA championships ever, and Malloy is a 4-time collegiate champion. To prep for London Malloy’s been working on visualization. This effort is about her recalling prior positive experiences. When she works out, Malloy applies that mindset as she visualizes where she’ll be and who she’ll be going against to “be there ahead of time.” At the Games she aims to go into battle “attentive and ready” using her unique pre-match approach. Malloy warms up hard and fairly long so that her mind and body are in “mid-practice” mode – so that as she gets on the mat she hits the ground running and doesn’t look back. Previous articleIs the Ultrabook All It’s Cracked up to Be? Tom is Director of Business Strategy with HicksNewMedia, a technology consulting and digital publishing agency on the web and social media frontier.